A Tinytag Thermocouple data logger is available, providing monitoring for a broad range of temperatures. This highly versatile logger will meet the specific demands of many applications and industries. 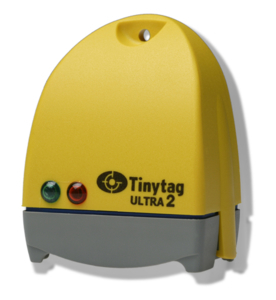 The Tinytag Ultra 2 Thermocouple data logger offers all the recognised benefits of thermocouple temperature monitoring - fast response, versatility, cost-effectiveness and ease of use. The unit supports the most popular thermocouples types - K, J, T and N -providing monitoring for temperature ranges from -270°C to 1370°C, depending on the type being used. This makes it suitable for a wide range of applications, including the accurate monitoring standards demanded by the food processing industry, to the extremes of temperature experienced in hot industrial processes such as smelting, right through to conditions experienced in freezers. Thermocouples are available either as bare wire, offering lower cost and faster response times, or built into probes designed for specific uses depending on their type of construction or insulation material used. The logger also has a built-in temperature channel allowing the particular process and the ambient air temperature to be monitored simultaneously. Furthermore, the new Tinytag thermocouple logger offers additional versatility by incorporating a connection that supports both standard and miniature thermocouple plugs. The unit features burn out response - the option to configure the logger to drive readings either low or high in the event of thermocouple failure, making it obvious to the user that a problem has occurred. The compact, stand-alone logger has a battery that lasts for over a year, and like all Tinytag products it is compatible with the easy to use Tinytag Explorer software. Data is downloaded to a PC via a USB cable where the software clearly presents the data as graphs and tables.